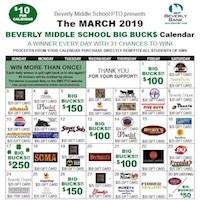 Beverly Middle School Homeward Bound: Big Buck$ 2019 - Let's Go BMS!! Let's Go!! Calendars are just $10 each with great winnings throughout the month of March. See the 2019 Big Buck$ Calendar here. Your student should turn in the BOTTOM slip from the calendar all filled out with cash or check made out to Beverly Middle School to their first period teacher every day they have them! The buyer should keep the calendar portion! The homeroom in each grade with the most calendars sold by February 14 wins a BAGEL WORLD BREAKFAST! Sell 10 Calendars – your child will get entered into the raffle for an iPad!!!! If you need more calendars at any time, contact BMS PTO parents, Amy Broadbent abroadbent10@gmail.com or Nancy Stanley nancyptrain@msn.com. Thanks in advance for your enthusiasm and participation in making this such a successful fundraiser! !